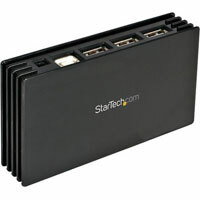 The 7 Port Compact USB 2.0 Hub From Startech provides 7 Hi-Speed USB 2.0 ports for your high-speed connectivity needs. This device is USB 2.0 certified and provides a data transfer rate of up to 480 Mbps (high speed). The 7 Port Compact USB 2.0 Hub is Plug-n-Play, hot swappable and portable.